Evidence continues to reveal the importance of a healthy microbiome, or the community of bacteria that lives within us. The ratio of good to bad bacteria in the gut influences overall wellness in a variety of ways, and it's essential to maintain a healthy balance. One of the easiest and most effective ways to achieve a good balance of bacteria is by consuming fermented foods. Fermentation is one of humanity's oldest attempts to preserve food. 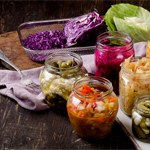 Fermented foods are rich in probiotics, the beneficial bacteria that are key for optimal health. These bacteria replenish your microbiome, and research suggests that gut health affects immunity, inflammation, allergies, autoimmune disorders, and even weight loss. Fermentation also enhances the bioavailability of nutrients from food, releasing a food's full nutritional potency while easing digestion by "predigesting" certain components of the food (like sugars, for example). Fermentation enhances protein quality and can produce unique antioxidants and anti-inflammatory compounds that did not exist prior to fermentation. You may be familiar with fermented foods like kefir, kombucha, sauerkraut, miso, and tempeh, but also consider fermented greens. Fermented grasses, fruits, veggies, and herbs deliver a broad spectrum of highly bioavailable nutrients along with clean, plant-based protein and beneficial probiotics. Look for fermented greens and other fermented foods at your natural market. A daily serving will provide the nutrients and other compounds to nourish your microbiome and support good health. Serve with sliced tomatoes, black olives and sweet onion.